Bayan-Olgii is a unique place in Mongolia, home of the Kazakh ethnic group. The Kazakhs have a rich culture, close extended families, and many traditions that are still practiced today that are centuries old. The Kazakhs are the second largest ethnic group in Mongolia after the Khalkhs, with 101,000 people comprising 5% of the population. Most live in Bayan-Olgii Aimag, where they make up 90% of the inhabitants. The aimag or province was created in 1939 as a semi-autonomous homeland for Kazakhs living in Mongolia. Today, Bayan-Olgii has a distinctly Kazakh culture. Kazakh is the language of everyday communication, with Mongolian used for inter-ethnic interactions and official communication. Islam is the primary religion of the Kazakhs. The Kazakhs trace their origins back the 15th century and the founding of the Kazakh Khanate by a direct linage of Chinngis Khan near the Aral Sea in present day Kazakhstan. The Khanate was formed in the wake of several other declining kingdoms including Mongolistan, Nogai Horde, Ak-Orda, and Khanate of Abulkhair that controlled much of Central Asia and trace their beginnings back to the family of Chinngis Khan. 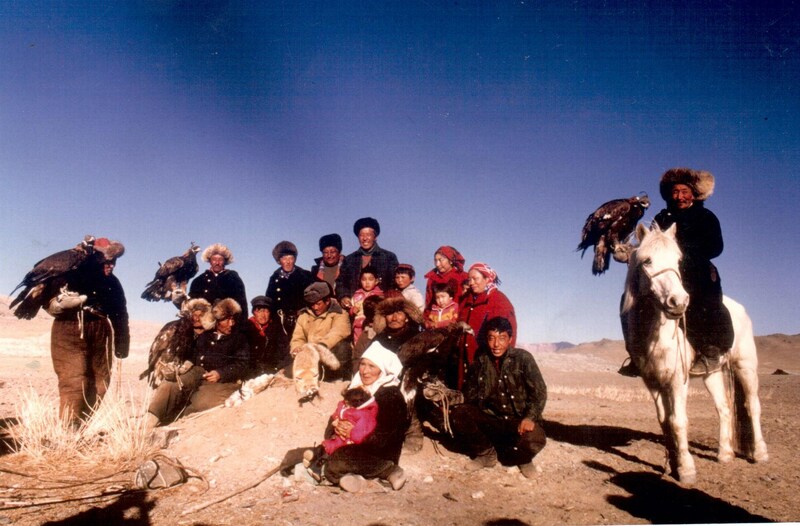 The Kazakhs were themselves descendents of Mongols and other nomadic tribes of Central Asia. The Kazakhs quickly developed a distinct identity and a powerful state for several hundred years until the Russian Empire began absorbed the Kazakhs in the mid 18th century. It was during this period that Kazakhs fled into the lawless region of the Altai Mountains in China and Mongolia. When the Soviet Union and China established borders, Kazakhs in Mongolia were isolated from their brethren until the 1990s. During this time, nomadic herding and the traditional way of life was completely suppressed in the Soviet Union. 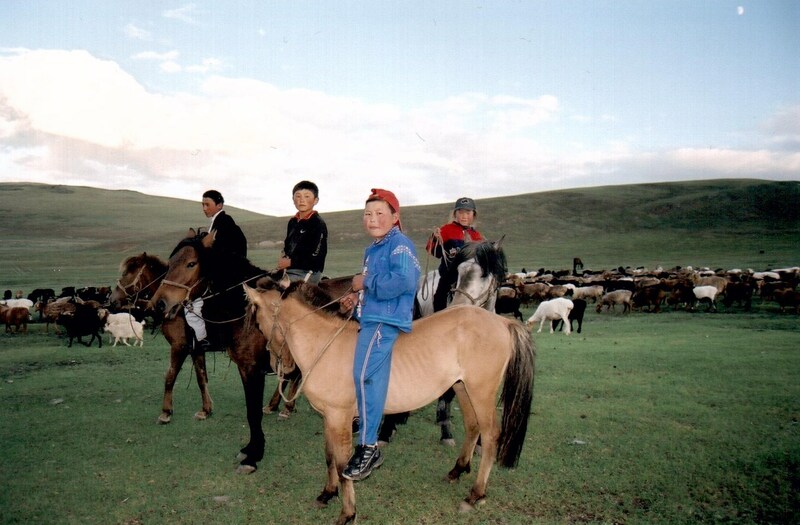 The traditional nomadic lifestyle was only preserved in the undeveloped steppes and mountain ranges of Mongolia. 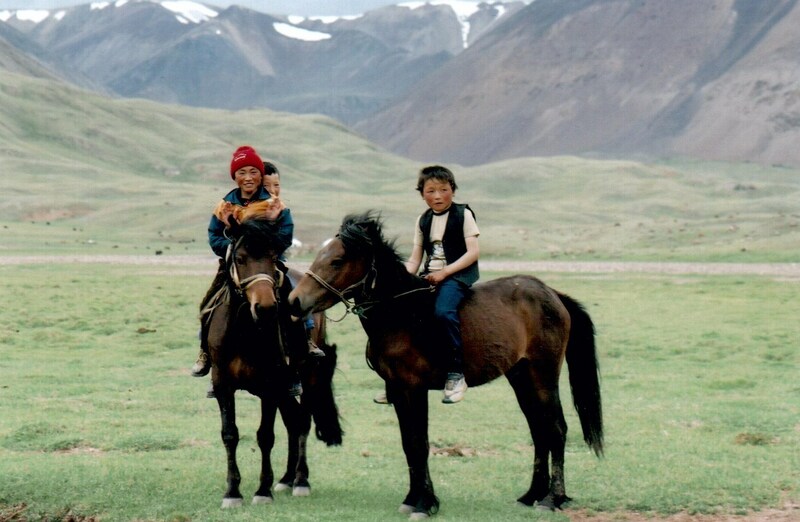 About half of the Kazakhs in Mongolia moved to Kazakhstan after independence in the 1990s. Though many came back, the Kazakhs maintain close ties to family in either country. 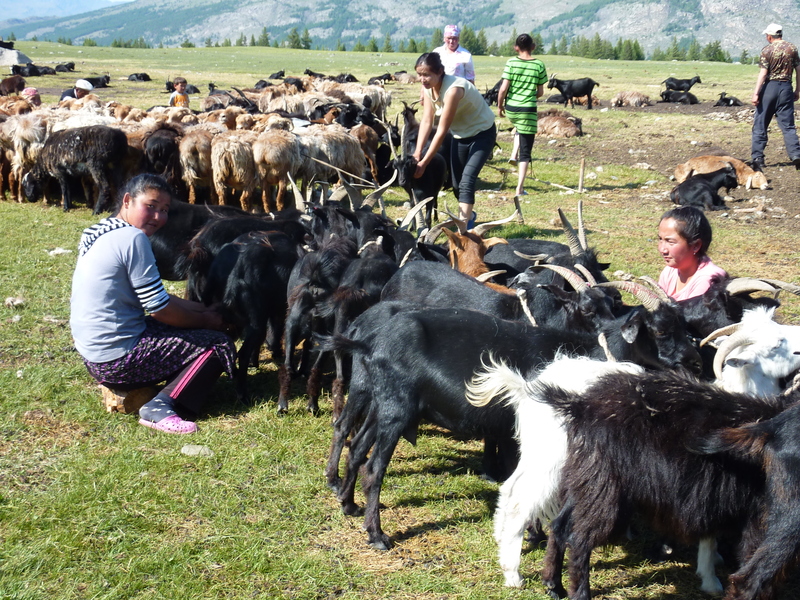 Today, many Kazakhs in Bayan-Olgii maintain traditional semi-nomadic herding by moving with their animals several times a year, and living in a Kazakh style ger (larger and taller than a Mongolian ger) during the summer. All Kazakhs keep close ties to extended families. Tradition requires that one must not marry anyone related within 9 generations. 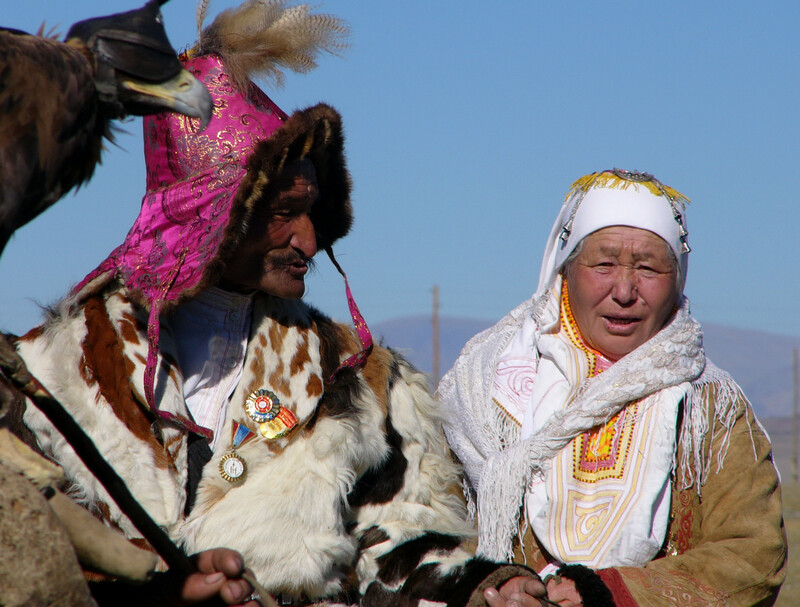 As a result, upon meeting each other, Kazakhs always tell if and how they are related. This is not their only tradition, though. The most visible expression of tradition one will notice is the world famous art work of these nomadic people of the steppe. 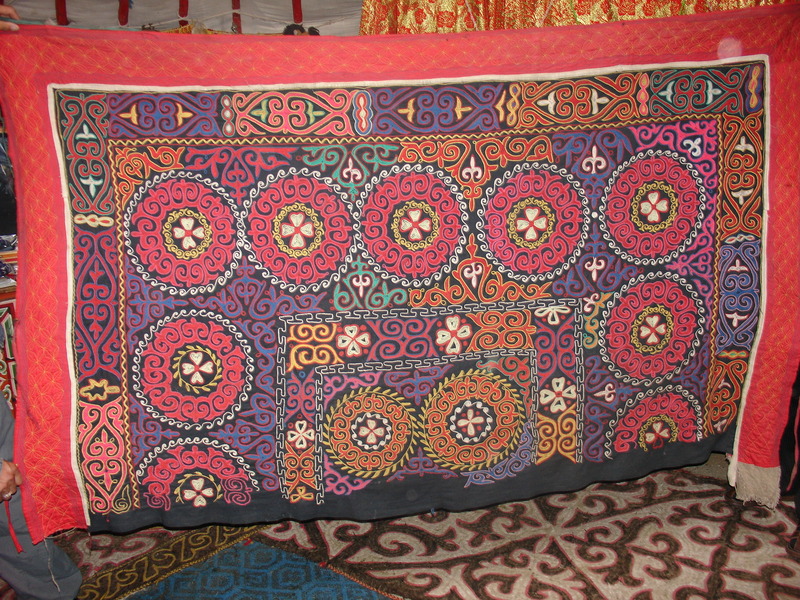 Kazakhs are famous around the world for their intricately embroidered wall hangings (tuskies) used on ger (yurt) walls. A typical ger may have 5 to 7 wall hangings that can take 200 hours to hand stitch each. The curving designs of the wall hangings are patterned after goat horns which symbolize the primary source of wealth of the nomadic herder. This design is used for a wide variety of traditional clothes, home furnishings, and accessories. The Kazakhs are not only known for their artwork, but also for their incredible friendliness. 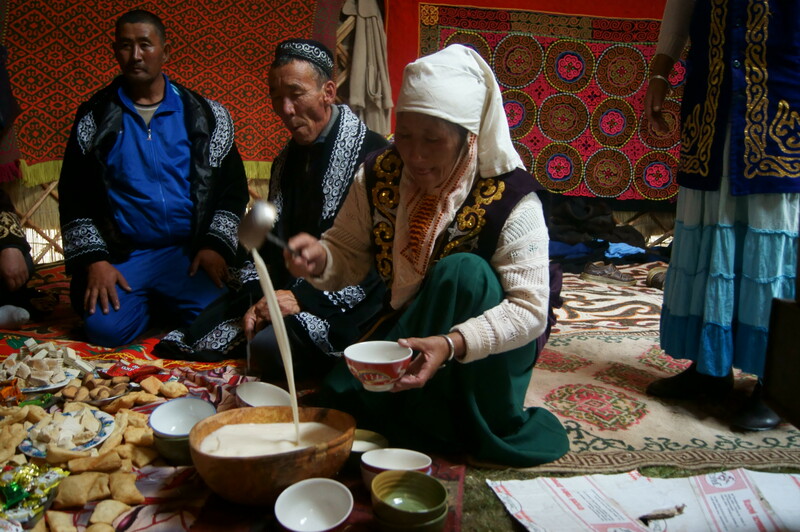 After meeting a Kazakh, you will be impressed by the generous hospitality expressed through expansive meals with many dishes and countless cups of milk tea and sweets. Like other tribes of the steppe, Kazakhs love to sing and play music. After dinner or while travelling, one will pull out a dombra, the national instrument of the Kazakhs, and play a traditional folk songs that reminds one of the time of the great warriors of Central Asia. Living is such a sparse land; they make the most of celebrations, with music, dancing, and horse games. The biggest celebration is Nauryz, the Kazakh New Years, which is celebrated in March. But whatever time of year you visit Bayan-Olgii, you should go see a family. Go inside, have tea, and enjoy a delicious meal, including their favorites of kuz (a horse meat sausage) and bisbarmak (literally “five fingers”), and have fun. Kazakhs love to laugh and enjoy company. Listen to Kazakh music, and maybe sing a song for them. By the time you leave, both of you will call each other brothers, and you will never forget the incredible hospitality and spirit of the Kazakhs.